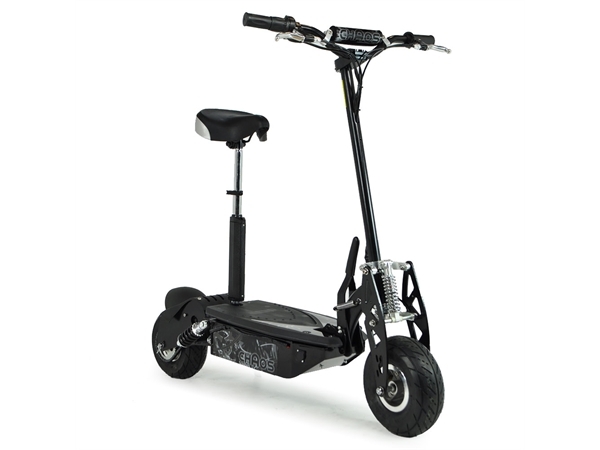 The new 1000W Chaos electric scooter has a better build quality and a higher spec. They come fitted with a 48 volt battery, as opposed to the older Evo 1000W’s previous 36 volt battery. This gives the Chaos 1000W a much bigger distance range and longer charge life. This is something that previous fans of the 1000w had been requesting the manufacturers improve upon. Let’s take a closer look at the new and improved Chaos 1000w. The engine is an electric motor, and uses a 12AH, 48 volt lead acid battery. The charger provided is a 110V to 240V. It has a life span of over 250 cycles before it needs replacing. 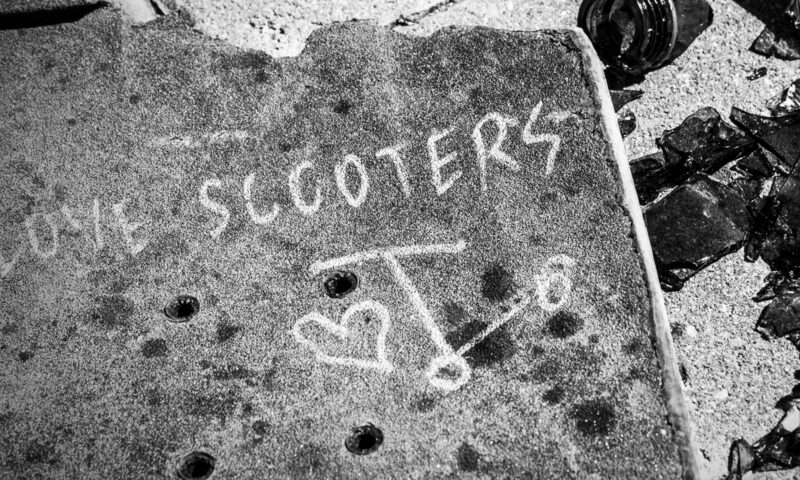 What size is the scooter? This scooter is 48 inches long and 42 inches high. Bear in mind that it also folds up with one move, making it really handy to store away in a corner somewhere. The net weight of the whole scooter is 40kg. It is not light! This is fine when you’re riding it or wheeling it around. But lifting it up and down steps is far from ideal, if for example you lived in a flat. So I would advise you store yours in a place where it can be wheeled in and out rather than lifted anywhere. What weight do I need to be to ride? The Chaos 1000W can hold a person up to 120 kg, that’s 265 pounds, or 19 stone. This weight limit is comfortable for most riders. The recommend age limit is over aged 14. This scooter is not for children and strictly an adult electric scooter. How fast can the 1000W go? The top speed is 42km/h, which is 26.1 miles per hour. It might not sound it, but this feels pretty fast on a scooter and is the top speed for these types of machine. Please bear in mind that this model of electric scooter is not technically road legal. I get asked a lot if you can ride these on main roads. This particular model is for use solely on private roads and areas. Ride them in public at your own risk. I know that some people do, but you could get in trouble if you were out on main roads. There is now an EVO road legal electric scooter that comes with rear view mirrors and other safety features. These need to be registered with the DVLA. 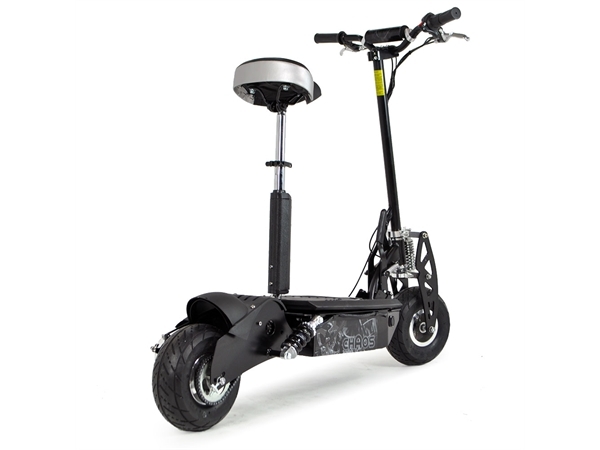 You can read my post about this road legal electric scooter here and visit the supplier to find out what you need to register it. The frame is made from chromoly steel. 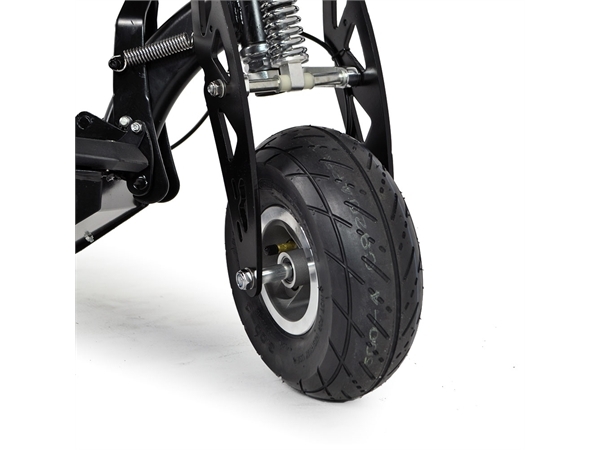 This type of steel alloy has an excellent strength to weight ratio, making it an ideal material for these scooters. The brakes are disc brakes, with a double front spring and a single rear spring suspension, plus a twist grip throttle. Does it come under warranty? There is a 6 month warranty included for manufacturing defects, and a 3 month warranty for the battery. There is the option to return it if you contact the supplier within 7 days. I would recommend you buy yours from a dedicated supplier like Funbikes. Why? They have a high “trust pilot” score of 8.1 out of 10 from 38 reviews, there are three dedicated phone lines to use that are not costly 0845 numbers, as well as a live online chat facility. I have always found them to be helpful and friendly. The only down side is that delivery is expensive. The cheapest option is £19.95. I would prefer that delivery costs be built into the price of the scooter so that you know exactly what you’re paying but this is just my personal preference. Read more about the Chaos 1000W and get yours here. Hiya thank you for the details I’ve found it really helpful however can you ride these on public footpaths like mobility scooters? Sadly not, check out my UK electric scooter laws post.